The Duct Tape Invitational arrived back on the old continent following its last European edition 5 years ago in Biarritz. This time the event was happening in Zarautz, Spain with a lineup littered with style and flair almost certain to entertain. A weekend for the ages. Just out of the water after a session with Joel, Alex, Justin, Tyler and the others, I travelled to get Nathan Sadoun at Biarritz airport. We returned quickly back to Zarautz to enjoy the last session before the night had taken over and the memory cards were completely full. 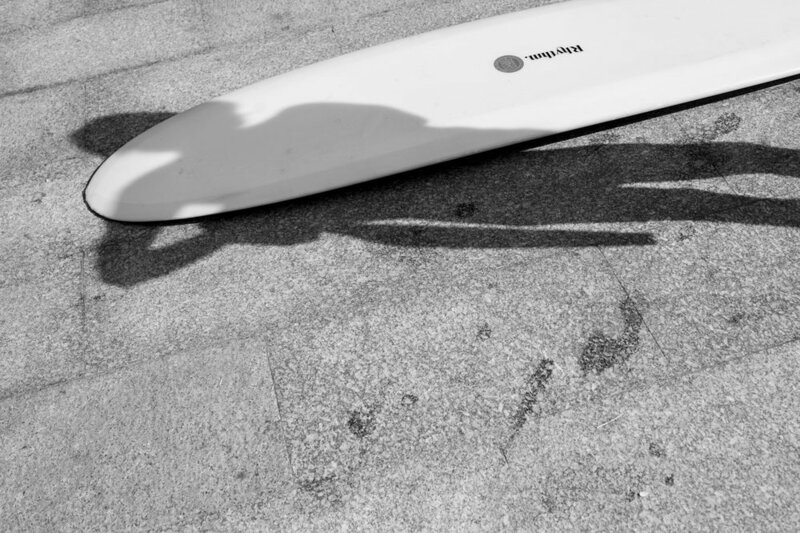 Following the arrival of the last guests, not always with their boards courtesy of the airlines, the party began with beers, a barbecue and live music alongside the beachside Zarautz skate park. We weren't really in the water, the conditions were not there yet but still it didn't seem to matter as everyone was kicked back and having fun with friends. With the heats postponed to the Sunday, an expression session was launched in the afternoon and the opportunity for the public to watch join in the atmosphere and soak up Zarautz. The final day I awoke early with an underlying excitement for the day, looking outside and the advertised conditions were as good as they'd hoped. Blue sky and glassy water. A good breakfast in front of the dreamy Zarautz breaks, a small session even for some, and the first round had started. The first heat with Rhythm rider Jordan Spee against Tyler Warren, Zach Flores and Adrien Lopez. The second heat saw Nathan's turn to put on the jersey, facing Ryan Burch, James Parry and Saxon Wilson. The semifinals started later in the afternoon following a barbecue and some live music. Jordan came against Tyler, Ryan and James and finished third behind Tyler and Ryan in the semi final. We finished the afternoon watching the show of the final. In the evening we took the van, put Cat Stevens on the radio along with Nathan, Jordan and Justin in the back to join the others a few kilometres from Zarautz at a winery located in the mountains. A final drink and meal with all these incredible people. Such a great time with all these stylish legends, to surf good waves, drinks some beers, eat some good local food. No matter the result, it's not about that. Throwing back to one of the original playlists of the Rhythm Radio Sounds movement. A collection of smooth jazz that will flow out of any stereo and dance in the breeze – perfect fit for a Zarautz journey.